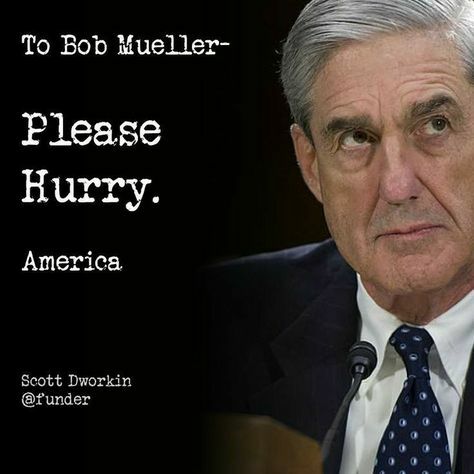 MUELLER WILL PREVAIL – IN RUSSIA PROBE! Will Special Prosecutor Bob Mueller Prevail Over Trump In The Russia Probe? Mueller Is An Ex-Marine (Vietnam War) — A Republican ‘Straight Arrow” — AND — RELENTLESS, To A Fault! He Took Down The Infamous New York Crime Boss – (GAMBINO FAMILY) – John Gotti! – In 1992. Gotti Died In Prison, Choking On His Own Vomit. He Took Over The FBI Right After The September 11, 2001 Disaster – To Rebuild The Intelligence Capacity Of The FBI & Restore Faith In That Institution. He Is Held In Nearly Universal High Regard By Most People – Irregardless Of Political Persuasion. There Doesn’t Seem To Be Any Blemishes On His Life Time Record Or Even A Hint Of Scandal Or “Irregularity”. Is He Our King Arthur – Of Camelot – In This Brief Period Of Time — A Shiny Place In An Otherwise Sea Of Total Darkness — Where Mueller’s Round Table Held Pure Evil & Malignancy At Bay & Carried Forward One Of History’s Greatest “Take Downs” Of A Truly Malignant & Evil Demagogue! The Dark & Dank Cellar! ← KAZAKHSTAN’S BTA BANK – BILLIONS – $$$ – SMUGGLED INTO U.S.!